Throughout April 2015 Sébastien Piquemal and Tim Shaw will visit a number of venues, festivals and Universities to present performances, talks and workshops around their new audio sound system. Fields, a performance which explores sound diffusion through the audience’s mobile phones, is being taken around the UK with a series of special events programmed in London, Manchester, Blackpool, Brighton, Bristol, Durham and Ulverston. Fields – A Year of Performances (2014) from Sébastien Piquemal on Vimeo. After a year of practical development, with European performances ranging from Helsinki to Lisbon, Fields will finally be touring the UK with 10 events across a range of different contexts. 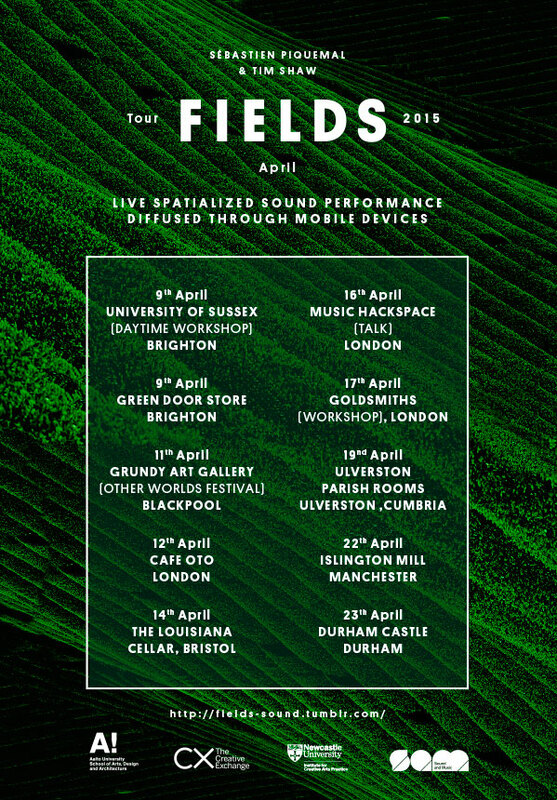 From the greatness of CafeOTO in London to an underground Norman Chapel in Durham (a World Heritage Site), Fields will be bringing its sonorous, omni-directional sound system to a variety of different environments.